Clouds block the sun, so more clouds should make us cooler — not warmer. Reality check: The clouds aren't going to save us from climate change. The vast majority of climate scientists are certain the world will continue to warm as we add carbon pollution to the atmosphere. What’s less certain is the exact AMOUNT of warming. Why? It all comes down to feedbacks — processes that amplify or reduce man made warming. Some feedbacks are well understood. Take Arctic sea ice, for example. As the climate warms and sea ice melts, less sunlight is reflected back to space, and more warming happens. But the net effect of cloud feedbacks is less well known. Some kinds of clouds warm the climate; others cool the climate. What will the overall result be? There’s growing evidence that at worst, the clouds will have a net warming effect. At best, they’ll have a slight cooling effect. But there’s no reliable evidence that clouds will somehow cool the climate enough to counteract man made warming. The effect of clouds in a warming world is a difficult one to predict. One challenge is that clouds have both warming and cooling effects. 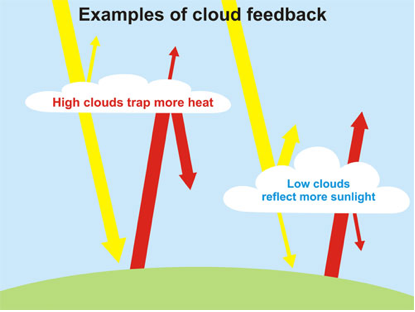 Low-level clouds in particular tend to cause a cooling effect by reflecting sunlight, while high-level clouds tend to cause a warming effect by trapping heat (Figure 1). Figure 1: Examples of how cloud feedbacks can cool or warm the surface of the planet. © John Cook. So as the planet warms, clouds can have a cooling effect if the amount of low-level clouds increases and/or if the amount of high-level clouds decreases. Clouds will have a warming effect if the opposite is true. Thus it becomes complicated to figure out the overall effect of clouds, because scientists need to determine not only if the amount of clouds increases or decreases in a warming world, but which types of clouds are increasing or decreasing. For climate scientists who are skeptical that anthropogenic greenhouse gas emissions will cause a dangerous amount of warming, their skepticism hinges mainly on this cloud cover uncertainty. They tend to believe that as the planet warms, low-level cloud cover will increase, thus increasing the overall reflectiveness of the Earth, offsetting the increased greenhouse effect and preventing a dangerous level of global warming from occurring. However, some recent scientific studies have contradicted this theory. Most of the cloud feedback uncertainty is due to cloud changes near the equator, in the tropics and subtropics. Studies by Lauer et al. (2010) and Clement et al. (2009) both looked at cloud changes in these regions in the east Pacific, and both concluded that based on a combination of ship-based cloud observations, satellite observations, and climate models, the cloud feedback in this region appears to be positive, meaning more warming. Dessler (2010) used cloud measurements over the entire planet by the Clouds and the Earth’s Radiant Energy System (CERES) satellite instruments from March 2000 to February 2010 to attempt to determine the cloud feedback. Dessler concluded that although a very small negative feedback (cooling) could not be ruled out, the overall short-term global cloud feedback is probably positive (warming), and may be strongly positive. His measurements showed that it is very unlikely that the cloud feedback will cause enough cooling to offset a significant amount of human-caused global warming. So while clouds remain a significant uncertainty and more research is needed on this subject, the evidence is building that clouds will probably cause the planet to warm even further, and are very unlikely to offset a significant amount of human-caused global warming. It's also important to remember that there many other feedbacks besides clouds, and there is a large amount of evidence that the net feedback is positive and will amplify global warming.